See you at Bull Circle 4 on December 2, 2013, Monday, at 7 PM in St. Lukes Bonifacio Global City. Our speakers are all doctors for this event. Dr. Janis Espino will discuss injury prevention, Dr. George Canlas on proper hydration especially for the marathon, and Dra. 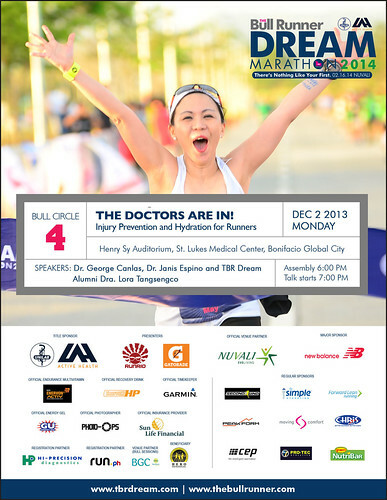 Lora Tansengco, TBR Dream Marathon alumni, will share her personal experience running her first marathon. Bull Circle are free and open to the public. No pre-registration required. For those who wish to purchase TBR University shirts, the shirts will be on sale during the Bull Circle. 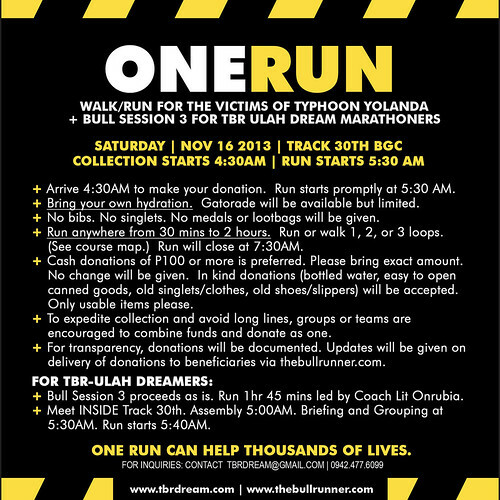 Everyone is welcome to join ONE RUN: Walk/Run for Yolanda Victims. Click HERE for more details. WHO CAN JOIN: Anyone who wants to help the victims of Typhoon Yolanda. You may run or walk anywhere from 30 mins to 2 hours. 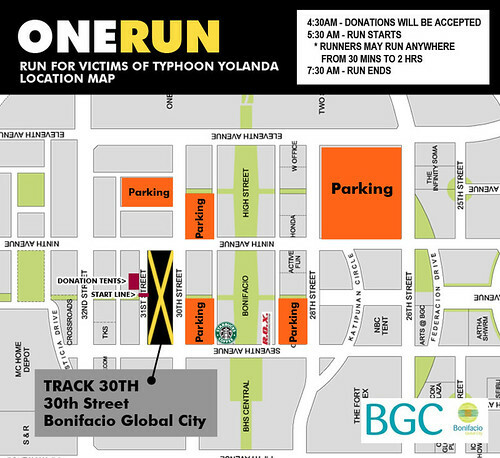 WHAT YOU CAN GIVE: We will accept cash donations of P100 or more per runner. In kind donations will be accepted as well. Unilab Active Health will collect and deliver directly to Red Cross. (1) Javier, Leyte – A portion of the funds raised will be handed over to The Master’s Light Foundation of runner/triathlete Maricel Laxa-Pangilinan. TBR and Maricel will decide on items to purchase which are immediately needed by the people of Javier in coordination with Mayor Sandy Javier. While many of the people here have survived, the entire town is devastated and they need immediate funds to begin anew. 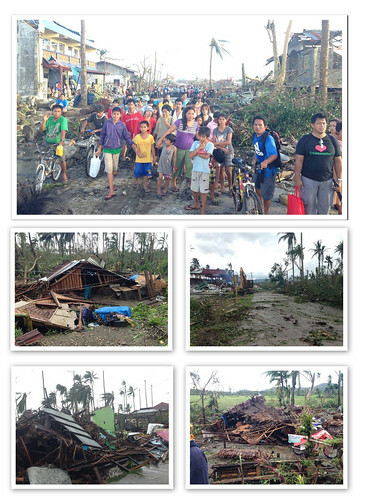 Photos of Javier below after Typhoon Yolanda struck. 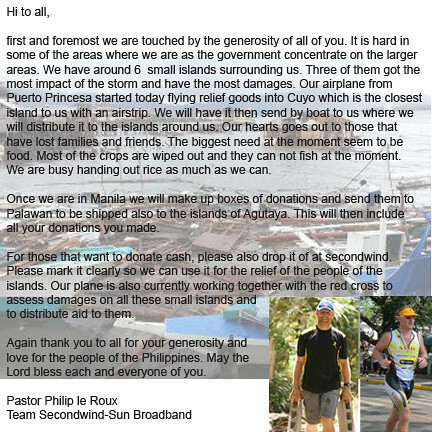 (2) 6 Island of Agutaya, Palawan – A portion of the funds raised will be handed over to runner/triathlete and Palawan-based missionary Philip Leroux of Team Secondwind-Sun Broadband who is personally helping with relief efforts in the 6 islands around him. Updates will be provided on this blog on how funds will be used. From Track 30th on 31st Street, RIGHT to 7th Ave., STRAIGHT to Justicia Drive all they way to 8th Ave. Before reaching Kalayaan road, RIGHT at 40th Street, RIGHT to 9th Ave. Then LEFT to 38th street passing University Parkway. 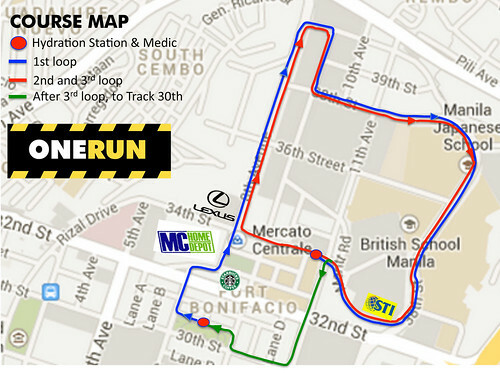 RIGHT to Meritt Road until you reach 34th street for the first loop. You may run one, two, or three loops. Note that all runners must be back at the finish line by 7:30AM. To finish, before reaching 34th Street, turn left to 11th Ave, cross 32nd Street. Right to 30th street until you reach Track 30th. Please take note of these reminders to keep the event safe and trouble-free. Bring your own hydration. Gatorade will be available but limited. No bibs. No singlets. No medals or lootbags will be given. Run anywhere from 30 mins to 2 hours. Run or walk 1, 2, or 3 loops. (See course map.) Run will close at 7:30AM. Cash donations of P100 or more is preferred. Please bring exact amount. No change will be given. In kind donations (bottled water, easy to open canned goods, old singlets/clothes, old shoes/slippers) will be accepted. Only usable items please. To expedite collection and avoid long lines, groups or teams are encouraged to combine funds and donate as one. For transparency, donations will be documented. 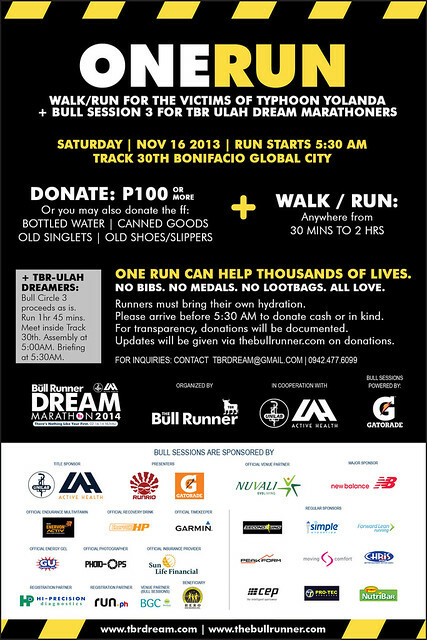 Updates will be given on delivery of donations to beneficiaries via thebullrunner.com. Bull Circle 3 proceeds as is. Run 1hr 45 mins led by Coach Lit Onrubia. Meet INSIDE Track 30th. Assembly 5:00AM. Briefing and Grouping at 5:30AM. Run starts 5:40AM. Thank you to Unilab Active Health and Gatorade for the support. Thank you to ProActive and Team Unilab Active Health for volunteers. Let’s all work together to do what we can to help Yolanda victims. We’ve all seen the devastation brought about by Typhoon Yolanda. It is horrifying, saddening, and painful to watch. So, instead of just watching, let’s use running to help out. One run can help thousands of lives. Please join us as we to raise funds for the victims of Typhoon Yolanda. We ask you to donate P100 (or more) or bring bottled water, canned goods (those that can be opened without a can opener), usable singlets and shirts, and slippers or shoes, then join us for a run around Bonifacio Global City. You can run as short as 30 minutes or as long as 2 hours. Run it with running buddies, friends, family, even non-runners. Everyone is welcome to join. No bibs, medals, lootbags, or hydration will be handed out. Please bring your own hydration. Gatorade will be there to provide a limited amount of drinks. Everything will be carried out simply so as to save what we can for those who really need it. All donations will be tracked. Please come before the run start of 5:30 AM to make your donations. To TBR ULAH Dream Marathoners: Your BULL SESSION 3 will proceed as planned. Assembly is at 5:00AM. Briefing by Coach Lit Onrubia is at 5:30AM inside Track 30th. There will be over 6 run-walk interval groups with Pacers. Run is 1 hour 45 mins. Thank you to Unilab Active Health for supporting us by providing tents, chairs, and tables. ULAH will also be responsible for shipping the in kind donations to the victims. There are just no words to explain the devastation brought about by Yolanda to our country. At this point, each one of us should really do our part to help out. Some of you may know Philip Leroux, a runner, triathlete with the Secondwind Triathlon Team, and running blogger (The Foreign Runner). Philip is a missionary based in Cuyo, Palawan. He’s a good friend of mine. see map and shop details by clicking on THIS LINK. For inquiries, call Secondwind directly. See you at our 3rd Bull Circle on Wednesday, November 6, 2013! Our speaker will be Coach Jim Saret. I highly recommend this talk for those who seriously want to improve their running performance. 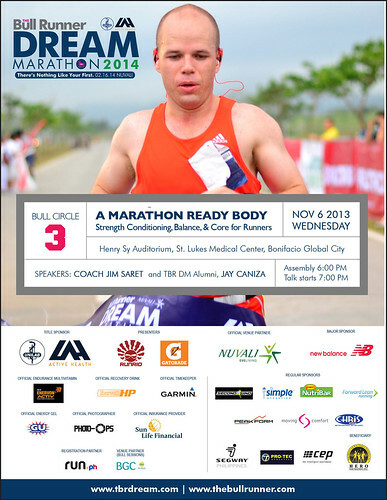 TBR DM Alumni Jay Caniza will also share his experience running his first marathon. 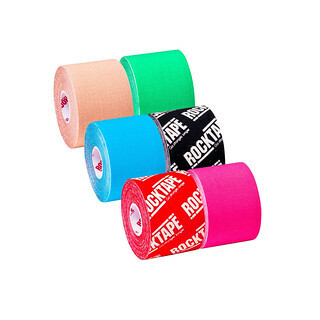 Free taping of one area for first 30 Dreamers at the Rocktape Booth during BULL CIRCLE 3. Beyond the first 30 Dreamers, taping of Dreamers using Rocktape will be at a fee of Php450 per area.